Route Charlie has been cancelled for delivery today, Monday, January 28th, due to the driver being unable to make it in and no other substitutes being available. All other routes are currently running. If anything should change, this post will be updated and an e-mail will be sent to the relevant routes. If you have any questions, please contact the Delivery Team via delivery_team@selco.info. Due to inclement weather, the Monday, January 28, 2019 meeting of the Professional Learning Community (PLC) is cancelled. Items that remain relevant will be shifted to the February meeting agenda. If you have any questions, please contact the SELCO office. SELCO is undergoing a reorganization of services and staffing. Join Krista Ross, SELCO/SELS Executive Director, for this 30-minute webinar for a quick update on this transformative process. Where: On your computer or mobile device! Due to inclement weather this evening’s, January 22, 2019 SELCO/SELS Quarterly Board meeting is being rescheduled for Tuesday, January 29, 2019 at 5:30p. Meeting materials can be found here. If you have any questions, please contact the office at 507.288.5513. LAUNCH: Information Portal Now Live! SELCO staff have developed an easy “one-stop shop” for a lot of the front line tasks that libraries contact us about; things like Horizon, interlibrary loan, delivery, reports, technology and training. We’re happy to announce that the new Information Portal is now live! Please take some time to look through the site to see what is available. Below you’ll find instructions for adding a bookmark for the link to your browser and we’ve added a new Quick Link entitled “Info Portal” at the very top of this website. The goal of this portal is to put information about a number of daily tasks in one place. We’ve done initial testing of the site with various groups but if you have feedback, please click the Suggestions link at the bottom of the portal website and fill out that form. Thanks to everyone who assisted with testing and providing content and feedback along the way. Your input was highly valued – we couldn’t have built this without you, and we will appreciate your feedback as we continue to improve it. Limited Free Cataloging for Schools and Small Public Libraries Launch! As of January 1st, 2019, SELCO will catalog up to 20 items a month as a part of your automation fees for small public and all school libraries using the Horizon system. Congratulations to Hokah, Caledonia, Lanesboro, and Willow Creek Middle School in Rochester who have already submitted items under the new cataloging submission form. SELCO catalogers are hard at work getting bibs into the system. If you’re a small public library or a school, please send your cataloging our way! As always, before you submit those items, make sure that there is not already a bibliographic (bib) record that will work in Horizon. Search Horizon by both ISBN/UPC and title to see if you can find a bib record that will work for your item in hand. A good reference on whether or not you can use a bib for your item can be found here. If you search by title and find a record that will work, please add the ISBN into your record (if you have cataloging permissions in Horizon). An email has been sent to directors and flyers went out in Delivery today, announcing changes in accessing the Help Desk. 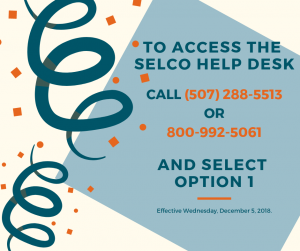 Beginning Wednesday, December 5, SELCO will have a new phone system with an automated attendant. This system will streamline our phone communication and reduce costs. The biggest change library staff will feel as a result of this is that there are no longer Help Desk-specific phone numbers; we will simply use the main number and toll-free number to access the Help Desk. In order to do so, you will dial (507)-288-5513 OR 800-992-5061 and choose Option 1. We ask that directors ensure that they share this with staff. A flyer is going out in Delivery today to each of our online libraries, and a revised copy of the Help Desk flyer that is typically shared in the Back-to-School packet is attached so that you may print and post as many copies as needed throughout your site and in procedural manuals, etc. You may begin using the “new” numbers immediately. They are, again, (507)-288-5513 OR 800-992-5061. The phone system switch will be made on Wednesday, December 5, after which the old numbers will no longer be in service.